No matter how many extruders you can manage, that is the max number of colors you will have. If you have a mixing extruder then you may get more shades and colors, but without too much precision, unless you purge a lot of plastic, which means much slower printing. If time is not critical, it may be useful. Also is the only goal to print in colors? I think it's more interesting to mix different materials: support, rigid, flex, conductive and textured, all in one print. With proper purging you can do it, at the cost of some time. And for color, painting the object will give you unlimited colors (ie inkjet or such). thank your paucus for the tip on monolith, I'll inspect it on usability for my purposes. I did already create a working plugin for gcode post-generation, creating a special prime zone for unwanted mix colors and configurable pre-change of the extruder (because of the latency between changing the extruder and having the new color on the working part). At the moment it is working, but not really in shape to be published. But for shure I will publish it. Actually I do my best to make it usable for the post-generation of cura (an more generic ) gcode. very nice milled and drilled part, but where is the heater? Yes, minimizing the melting room seems to be the best approach but there are several others that can be helpfull. and may be a lot of other good ideas. I am working on a similar approach, you can find it on [www.thingiverse.com] . Its already working and able to print nearly unlimited colors and tones (but only blended, not mixed, what makes a difference an bigger nozzles, less on small nozzles). manual controlled via smartlcd or from the printer via I2C (using the BlinkM feature of marlin). This setup can manage up to five extruders. My machine is loaded with red, yellow, blue and white or transparent ABS (any experiences with cyan, yellow, magenta?). Yes, the precision of mix and timing is limited but manageable and the purged amount of filament is depending on the count of layers and therethrough necessary colorchanges. For this reason I am working to get my post-processing compatible to cura, because cura minimizes the count of colorchanges per layer. this ist what I already succeeded in. " (for example change extruder 3cm before change color etc..) " could be done easy. My implementation is in perl and in beta stadium, but could already be called as post processing in slic3r. Actually my challenge is to get the purge area working and fixed to the bed until end of print, because is not shure that the (lets say 5 mm) of unwanted mix color would fit into the infill of the color before or after the change. These areas have different size and infill density and might be to small to take the whole colorchange(depending on the printed model). But if you like to experiment only with 'parametric prechanging', I could deactivate all this purge stuff. The prechange ist managed by a default value or a given argument (f.e. X mm) and is done at the last gcode command at which the extruders position is less than Xmm before the point of change. This means the point of change is not exactly adressed, but within the length of the last single extrusion command. The original extrusion command is not splitted (might be possible on straight moves, but much more complicated on arc moves). If interested, pls pm me. i dont see mixing happening in your extruder , just color change in one hotend .So how is it a multicolor hotend? yes you are right, there is no active mixing in the hotend. The result are blended colors with more or less "toothpaste effect" this effect depends on nozzle diameter and used colors. With a 0.3 nozzle the effect is minimal. Already have a plan to integrate active mixing, but first I want to finish the purging and prechanging slicer plugin, because the active mixing hotend will need this also. I know that the sealing will be the main challange on active mixing. I dont expect to create photografic exact prints, but a bit more color in 3d printing would be nice. Yes, thats what I also want to do. May be with a srew about 3mm diameter, the unthreaded part through a piece of teflon tube, the tube threaded and screwed into my peek barrier, fixed with two countered nuts, as long as it reaches the hight where its as cold that the filament can not be weak. Some kind of self sealing bearing. if you only intend to mix the filament and don't need exact rotation angles, there will be no need tu use a stepper motor. For this case i would suggest to use a geared 12V dc motor like [www.ebay.de] controlled via PWM f.e. using something like this [www.ebay.de] . I'm experimenting with sublimation ink as @regpye and the result was very successful. During the test I colored the filament right before the melting part but without any way to control it. Edited 1 time(s). Last edit at 04/17/2015 03:28AM by MarcoC. I have read through all the posts to this topic, and I am trying to understand how the color information even would get to the G-Code in the first place. Is there a 3D file format that will hold the color information that is to be sliced? Doesn't .STL file format only support geometric information and nothing regarding color? Design your project in Openscad with the colours -> export to .amf format then used Slic3r file --> Combine multi-material STL files... to re-assemble the colour .amf files exported from Openscad to build an assembled .amf file. Then used Slic3r to slice the .amf file to a g-code file. Why not develop a solution that will color the print AFTERWARDS? That would be much easier to accomplish. Print it in natural white then use a rotating system that sprays (airbrush, inkjet etc) the color onto it. Because the object may have cavities which are unreachable by a mechanical device, but are still visible. It works pretty well, getting even photo-quality prints! Since it's painted as the object is being made, you don't have any problems in reaching internal cavities and such. It's painted from above, just like the plastic being deposited. Issues remaining to solve are getting a better instrument for painting than markers, since they dry out and get flattened tips quickly, so unless you recalibrate each layer you start to lose fidelity. But overall it's a proof of concept that it is possible to do! Looking at other technologies... Initially, monitors were monochrome, but then 4 colours (CGA, 1981), 16 colours (EGA, 1984), 256 colours (MCGA, 1987), and eventually 24-bit colour (SVGA, 1990) became the norm. Once colour was introduced, the rate of change was rapid. 2D printers have skipped the intermediate stages and gone fairly directly from monochrome to gray-scale to 24-bit colour. I expect that 3D printers will also rapidly transition from one to millions of colours. To make that happen, some kind of colour mixing is going to be required. Therefore IMHO, multiple nozzles, if they survive, will be used to handle multiple materials, not to control colour. I've seen inkjet technology mentioned a couple of times in this thread. It seems to me to be the best way to achieve colour mixing... just squirt the dye onto the molten filament as it comes out the nozzle. However, the cheap inkjets we're all familiar with use water-based inks, so they're not suitable. Apparently (from [en.wikipedia.org]) vinyl, etc printing uses organic solvent dyes. But no-one seems to have experimented with that, let alone produced anything. I wonder why that is? Several people have successfully used Sharpie or similar markers to dye filament *before* extrusion. I wonder if you could draw with the Sharpie on the previous layer before laying molten filament on it? Or spray tiny amounts of Sharpie ink onto molten filament to colour it? 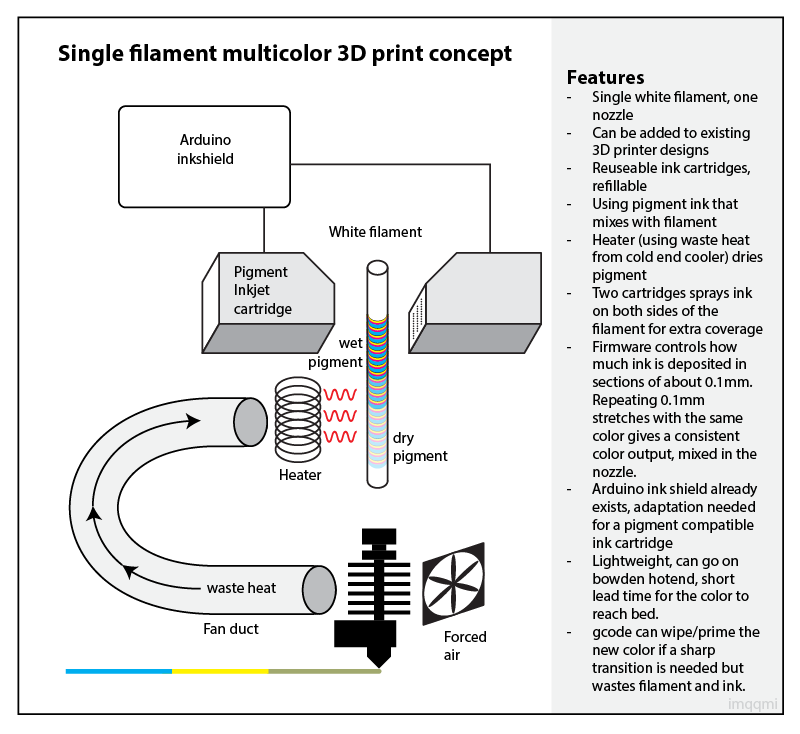 [groups.google.com] (from 2013) shows the use of polyester dyes to colour PLA & ABS objects after they have been printed. [makezine.com] shows how to dye nylon (polyamide) objects after printing. I also wonder what kinds of dyes are mixed into PLA and ABS before producing filament. Could that mixing process be put at the end of the chain, at the point of extrusion, rather than at the beginning? Is the problem that these dyes need to be mixed in tiny quantities with relatively large amounts of plastic (e.g. 1ppm)? So the right quantity for 1 cubic mm of filament is one cubic micron of dye. And that needs to be dispersed fairly thoroughly throughout the cubic mm? Painting after extrusion, on the other hand, is on cool plastic. One thing to remember about painting is it does not need to be a full-color spectrum capability in order to be useful... being able to paint in just a few colors is still a huge advancement and more than sufficient for many kinds of didactical objects. I think, dying filament after extrusion is complicated, because you would need "inkjets" all around the nozzle and the slicer would then control, which inkjet is on duty. I was wondering, why the danish guys from the Diamond hotend got their kickstarter campaign goals in "no time" and all the other guys here are discussing dye-techniques for more than 3 years now, almost without result. Guys, there is a ton of money waiting out there!! Edited 1 time(s). Last edit at 06/08/2015 03:58AM by o_lampe. The inkjet can be in a separate attachment and work after the current layer is finished. The slicer does not need to do it, we used a separate program to generate the needed gcode and merge the result with the objects' gcode, so no mods are needed to the Slicer itself. It works. Just thought of a concept to make a full color 3D printer with single nozzle and filament extruder. It uses a (preferably piezo electric) pigment ink jet cartridge with a drying mechanism so that no bubbles form. It recycles the cold end cooler waste heat and adds some more heat (if needed) so that the ink dries rapidly. maybe a cooler after that is necessary for PLA, as it may get too soft. I think ABS, HIPS and nylon would be a better choices. There's an existing Arduino shield for a HP inkjet cartridge that may be adapted for pigment inks. This whole concept leans heavily on if the pigment is strong enough to cover the filament well enough and if it'll stick to the filament (I know, it's a big if ). Even so, it may be useful even if only pastel tints are possible. Any change in color in a printed part may change its appearance a lot. The color can be controlled by printing the pigment in 0.1mm rings around the filament that's divided in cyan, magenta, yellow and black. The ratio of those within 0.1mm determine the color. For a constant color just repeat this pattern of 0.1mm rings. The sharpness of color changes will of course depend on the heat chamber inside the nozzle. Gcode can be employed to move the head to a dumping location, eject the old color until the new is primed and resume printing. This can be made optional so the user can choose between sharp color prints vs print speed (quality vs speed). The ink cartridges need 5 pins available on the arduino, according to the inkshield page. It may be necessary to have a separate arduino mega to handle the color printing part. It will need to know how fast the extruder is moving and what ratio of colors must be printed ahead of time. It can also be used to include some lookup tables for tone curves for calibration. With this system the most practical way to use it is to use 3-4 solid colors that are wiped and primed, printed one after the other per layer. Another would be a smooth transition on each layer changing the color. The advantage if inkjet inks is that these are pretty well matched CMYK colors, the availability of number of colors runs in the thousands. Another advantage is that this can be made into a module that can be added to many existing 3D printers as an upgrade. No multiple extruders are necessary and printing speed remains high. - A version with dye ink for nylon can be created too with a mere swap of the ink cartridges. 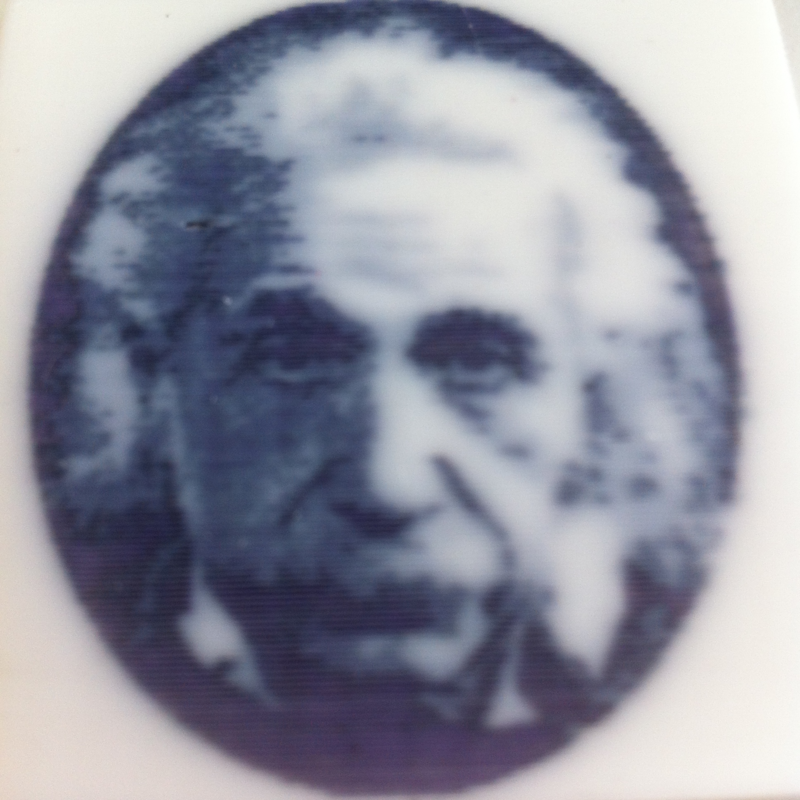 - A version with conductive inks can also be added to make any filament more or less conductive. Because the amount can be varied variable resistances can be printed. 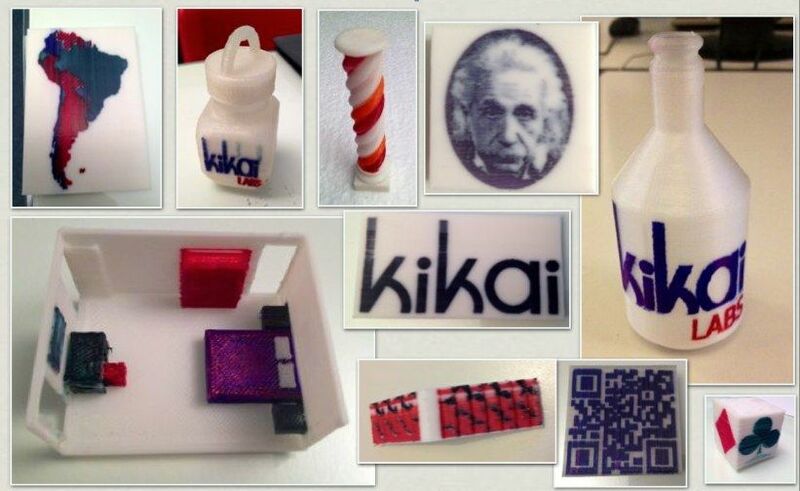 - A version with edible ink for food printing can be made, injecting it into the last stage of the syringe. - Soluble ink can be added to create porous materials for micro filters with a gradient etc. - There are two ink cartridges, they can be made controllable independently to be able to combine these options, as well as multiple printing modules. - A 'bowden' tubing system for ink storage off the x carriage. These systems already exists for large format 2D printers. I'd like to be able to 3D-print "photorealistic" objects (maybe I'm too ambitious). So, looking at imqqmi's idea... I'd want to see it in practice. I expect that the lag between the colouring and the extrusion would make it difficult to synchronise the laying down of the plastic with the colouring of the filament. I think that the ideal would be to colour the filament as it is being extruded out of the nozzle. But getting an inkjet to work reliably in that confined space and high temperature and moving-about environment would probably be problematic. I agree with paucus... you could do "photorealistic" with a single inkjet head (or one per colour)... after printing a layer of plastic you would do a second pass with the 3D printer head repositioned so that the inkjet head follows the same path as the nozzle did. But a prototype based on magic markers wouldn't persuade me to invest in developing an inkjet solution. I had a look at inkjet inks, and they all seem to be water-based. That seems to me to be an immediate problem, in that the ink won't dissolve/mix into the plastic. At best, you'll have a layer of dry ink on the surface, which hopefully will be captured rather than rubbed off when the next layer of plastic is laid down. At worst, you still have water on the plastic when the next payer is printed, causing bubbling, poor adhesion, and so on. I wonder about something based on Laserjet toner. Somehow (electrostatically?) deposit toner powder on the filament as it comes out the nozzle, so that it gets mixed into the plastic as it is laid down. My guess here is that we would need some kind of simple additive to inkjet refills that would penetrate the plastic and evaporate quickly – to make this affordable (like if words "affordable" and "inkjet refills" can stand next to each other) we should use refills as those are widely available. For such additive acetone first comes to mind. It penetrates ABS and evaporates quickly. Does someone have a concept of such inkjet head? Some amount of testing with different concentrations, inkjet brands and different additives is needed. I notice that Adrian Bower added this gcode [reprap.org] to control an inkjet in July, so perhaps RepRapPro has something under development. I too like to see it in practice but I don't have the resources to investigate the idea unfortunately. I've read in the news that stratasys and adobe are working on a fullcolor workflow that can be easily used using the 'core applications' from adobe. I use photoshop and illustrator extensively so that could be interesting, even though a stratasys machine would be outside my budget but I think some diy spin offs may follow suit. There are other types of ink that can be investigated, like wax and resin inks. Availability to consumers is not very good though. I can also imagine that one of the ink tanks can contain a primer that's printed first that allows the ink to stick well and dry quickly too. I guess this is firmly in the hands of ink jet printer manufacturers to put such devices on the market. As I understand it there are all type of inkjet inks, including oil-based, wax-based, etc... some ink should be appropriate. Not all inks can be used by all inkjet nozzles, so maybe we'd have to use a more expensive nozzle.